Adropin is a peptide highly expressed in the brain. Emerging evidence indicates that low plasma levels of adropin are closely associated with aging and endothelial dysfunction. 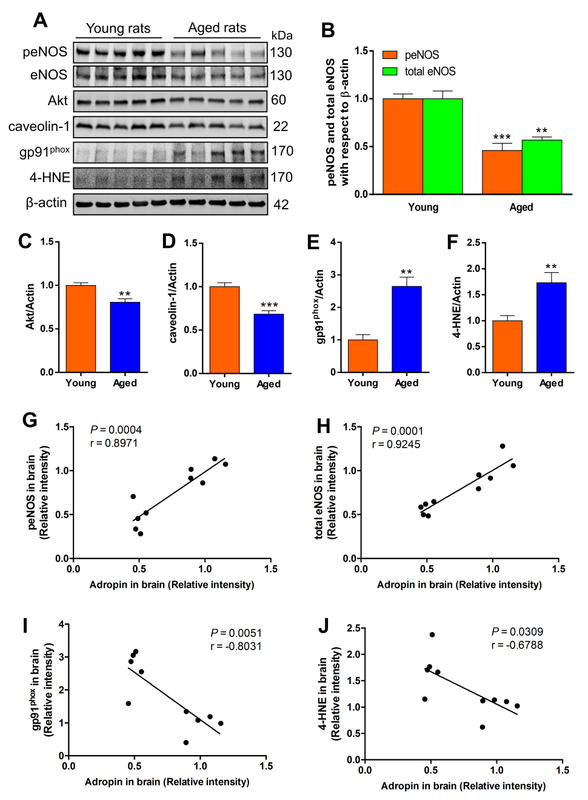 We hypothesized that aging reduces adropin levels in the brain, which correlates with reduced endothelial nitric oxide synthase (eNOS) and increased oxidative stress associated with age-related endothelial dysfunction. Cortical brain tissue and plasma were collected from young (10-12 weeks old) and aged (18-20 months old) male Sprague-Dawley naïve rats. Using RT-qPCR, we quantified the mRNA levels of the energy homeostasis associated (Enho) gene encoding for adropin. Western blotting was utilized to measure adropin and markers of endothelial dysfunction and oxidative stress in the brain tissue. Levels of adropin in plasma were measured using an ELISA kit. Compared to young rats, both Enho mRNA and protein levels were dramatically reduced in the aged rat brain, which was accompanied by a significant reduction in plasma adropin levels in aged compared to young rats. Additionally, total and phosphorylated levels of endothelial nitric oxide synthase (eNOS) were significantly decreased in aged rat brains and were associated with dramatically increased gp91phox-containing NADPH oxidase (a major source of free radicals) and 4-hydroxynonenal (4-HNE), a lipid peroxidation marker. Brain levels of Akt and caveolin-1 were significantly reduced in aged rats compared with young animals. Collectively, these findings indicate that adropin levels negatively correlate with markers of endothelial dysfunction and oxidative injury, which raises the possibility that loss of brain adropin might play a role in the pathogenesis and development of aging-associated cerebrovascular dysfunction. Yang Changjun,DeMars Kelly M.,Candelario-Jalil Eduardo. 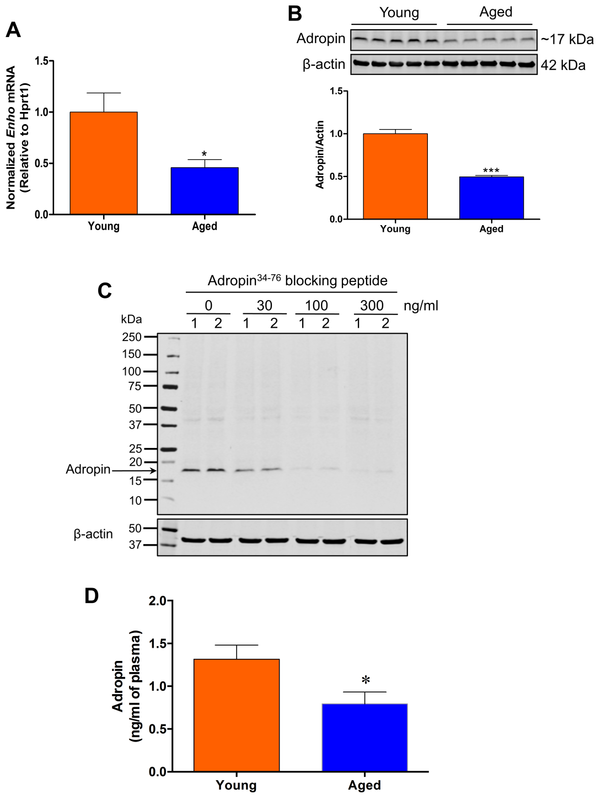 Age-Dependent Decrease in Adropin is Associated with Reduced Levels of Endothelial Nitric Oxide Synthase and Increased Oxidative Stress in the Rat Brain[J]. Aging and disease, 2018, 9(2): 322-330. A) Enho mRNA expression was significantly decreased in the cerebral cortex of aged rats compared to young rats. B) Cortical homogenates (50 µg of total protein) from rat brains were subjected to SDS-polyacrylamide gel electrophoresis and endogenous adropin protein levels were detected by Western blot. 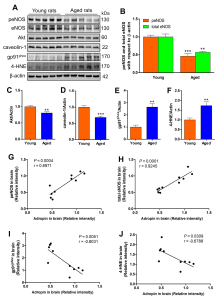 Representative immunoblots and densitometric data showed that adropin protein levels in the cerebral cortex were dramatically decreased in aged rats compared to young rats. C) Adropin antibody is highly specific. Cortical brain homogenates (samples 1 and 2) were denatured at 70°C for 10 min in 2X Laemmli sample buffer containing 4% β-mercaptoethanol, separated on 4-20% SDS-polyacrylamide gels, and then transferred onto nitrocellulose membranes. Before incubation with the membrane, the adropin monoclonal antibody was pre-absorbed with different concentrations of synthetic adropin34-76 peptide (0-300 ng/ml), which resulted in a concentration-dependent loss of the intensity of the band corresponding to endogenous brain adropin. D) Plasma adropin levels were measured by a commercial adropin ELISA kit. A significant decrease in adropin levels was observed in aged rats compared with young controls. *P<0.05, ***P<0.001 vs. young rats. n=5 for young rats, and n=5 for aged rats. Rat brain cortical homogenates (50 µg of total protein) were subjected to SDS-polyacrylamide gels and several biological markers for endothelial function and oxidative stress were detected by western blot. (A) Representative immunoblots for phosphorylated eNOS, total eNOS, Akt, caveolin-1, gp91phox catalytic subunit of NADPH oxidase, and 4-hydroxy-2-nonenal (4-HNE)-modified proteins in the cerebral cortex of young and aged rats. Densitometric analysis showed that total and phosphorylated levels of eNOS (B), as well as levels of Akt (C) and caveolin-1 (D) were significantly decreased, while oxidative stress markers including gp91phox (E) and 4-HNE-modified proteins (F) were significantly increased in aged rat brains compared to young rats. **P<0.01, ***P<0.001 vs. young rats. n=5 for young rats, and n=5 for aged rats. Positive correlation between brain adropin levels and phospho-eNOS (G) and total eNOS (H). A statistically significant negative correlation was found between brain adropin levels and gp91phox (I) and 4-HNE levels (J). Pearson correlation coefficient (r) and p values are indicated for each correlation analysis. Feng Tang,Meng-Hao Pan,Yujie Lu,Xiang Wan,Yu Zhang,Shao-Chen Sun. Involvement of Kif4a in Spindle Formation and Chromosome Segregation in Mouse Oocytes[J]. A&D, 2018, 9(4): 623-633.